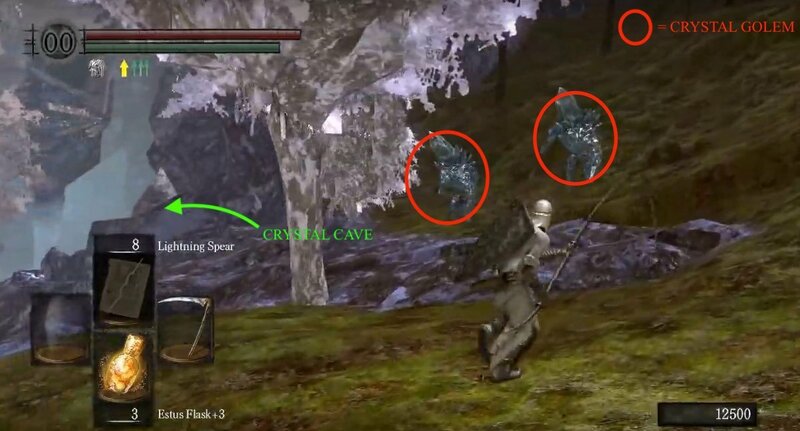 Crystal Cave is a location in Dark Souls and Dark Souls Remastered. This area is where you are able to take revenge on Seath the Scaleless and contains numerous invisible paths that you must find by watching the falling crystal snow hit the invisible ground. It is accessed through The Duke's Archives. You'll easily see the Crystal Cave from the inner garden of The Duke's Archives. If you would rather not have to fight all the Crystal Golems on your way through the garden, as you can quite easily out-run them. Head straight for the opening and start making your way down the crystal walkways. However if you wish to explore around, you can pick up a few nifty items, and pick off a few Crystal Golems. Head right to find a Blue Titanite Chunk. In the middle of the wooded area, you can find the Crystalline Set (armor worn by Crystal Knights). Heading forward and left, will lead you to two Crystal Golems blocking the entrance to the Cave. Inside the cave, after making it past the first Crystal Golem (again, if you run past him he will stop chasing you eventually) you will reach a point where the crystal walkway makes a Z shape, but don't follow this path just yet. Before you turn the first corner of the Z shape, on the left you will notice an opening with some snow falling and hitting thin air - or so it would seem. The snow is actually hitting one of the Crystal Cave's invisible paths. 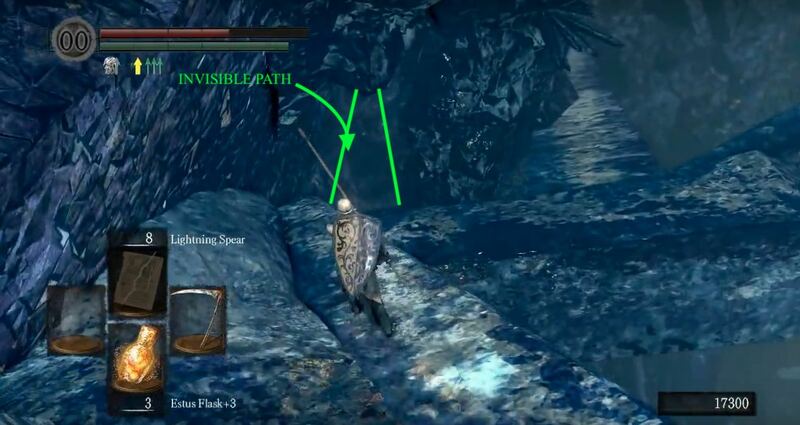 Note: The invisible paths are completely transparent walkways that are placed around the cave. You will need to traverse at least two of them to proceed deeper into the cave, and generally, get harder to cross the deeper you go. While there are a couple that are unavoidable, a good sum lead to non-essential secrets, such as this first one. The snow that you see falling is the signifier that such a walkway is present and it helps greatly in crossing them. As the snow hits the walkway you'll be able to determine where it is safe to walk. Prism Stones are also invaluable for crossing some of the latter ones, as they let you know if the area in front of you can be walked on and also then leave a colored marker at the point where it dropped, creating a trail that you can easily follow should you need to go back across the same path again - it would be advisable to save them for a secret invisible path you'll encounter later. This first invisible path is in a straight line, and if you simply follow it forward you'll find Humanity on a dead body. After that, continue down onto the platform just below to reach the path you just deviated from. You will come across a Moonlight Butterfly perched on a ledge. There's a few of these scattered around the cave and it's highly advised to simply ignore them, as they will attack relentlessly if you attack or move close to them. Continue away from the Butterfly and you will what appears to be a dead end cliff, if not for the Orange Guidance Soapstones and falling snow signaling another invisible path. 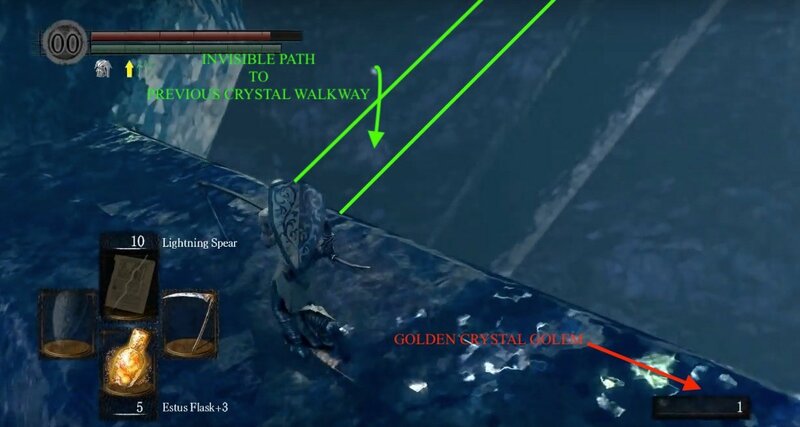 Before you go to cross it though, have a look out over the edge on the left as you approach the start of the invisible path and you should notice a Golden Crystal Golem waiting on a large crystal walkway. If you fought the one in Darkroot Basin or the one just outside the Crystal Cave in the garden of The Duke's Archives, then you'll know that these guys are very powerful - so be careful. It's in your best interest to lure the Golden Crystal Golem over to you rather than attempting to fight it on the narrow walkway it's on, or on the invisible path that leads to that walkway. So, use arrows to grab its attention and it'll then start heading over to you so you can fight it on a larger area of solid ground. 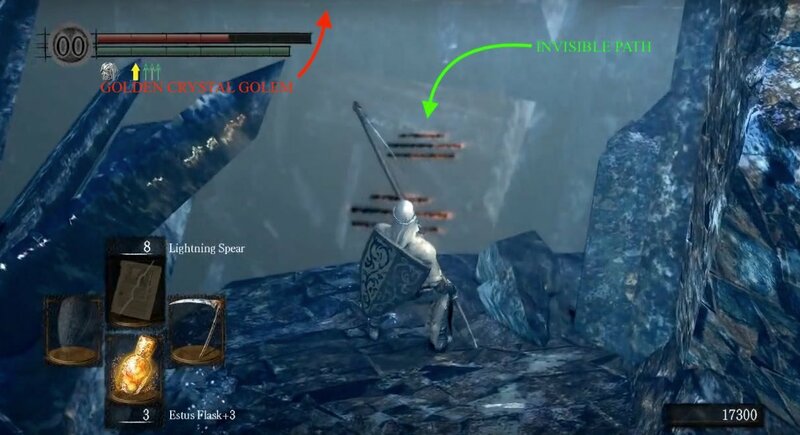 ( Tip: For an easy kill, wait at the edge close-by to where the invisible path ahead starts and keep firing arrows at it while it comes across the invisible path - there's a possibility that it'll attempt a jump attack at you from the path and fall to its death in the process). Once it's dead, head across the invisible path, this one goes in a straight line directly toward the large crystal walkway ahead, but again only walk where you can see the snow land, because you can easily fall off if you're not careful. Back out onto where you initially landed, you'll see a Golden Crystal Golem directly below you. 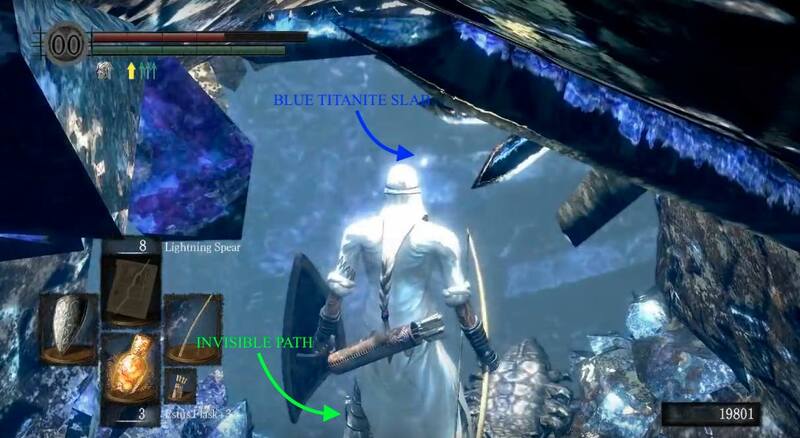 There is no need to engage this one (it will leave you alone as long as you leave it alone), however if you are feeling brave and/or feel the need for the Blue Titanite Chunk on the corpse next to the Golem, reach it by carefully walking off the right side of the invisible walkway. The limited space for this fight makes it quite tough, so good luck! Tip: you can use the same strategy you used on the first Golem here by going up the invisible path leading up to the platform formerly holding the first Golden Crystal Golem. Beware that this walkway is very easily to slip off of - one side is slightly steeper than the other, so avoid that side of the walkway to avoid falling. Head back up the invisible path that brought you down here and then make your way across the crystal walkway at the top until you reach solid land again - be careful not to slip off while making your way across. Return to the invisible platform directly above where the second Golden Crystal Golem stood and continue through to the other end of the tunnel to find another invisible path, but this one is not straight like the other ones - this path is full of sharp turns and bends. The key here is patience, only moving when you are certain - even if it means waiting a bit. Since the falling snow may be a little harder to use as a guide, Prism Stones are extremely helpful in determining where is safe to walk and they will also make the journey back much easier due to the trail they leave. Once at the other end, you will reach another crystal beam where you will find a Blue Titanite Slab - so it's absolutely worth the journey. TIP: If you find yourself short on Prism Stones, a more resourceful alternative requires a bow and arrows. Proceed slowly, shooting an arrow a meter or two forward every few steps to ensure there is a ground in front of you. Wherever there isn't, turn and fire the arrows wherever you think the path may lead, and follow the path that sticks. Head back to the tunnel and out the other end to the invisible path you fell onto before taking the above detour. Again, you can simply ignore the Moonlight Butterfly on your left. This invisible path goes in a straight line, but you should still make use of the falling snow for assistance if you feel you need it. When you reach solid land again you'll see the cave ahead where you should proceed, but before you go in, take a left and look around for a corpse holding a Soul of a Hero - be warned though that when you pick it up you may incite the aggro of the nearby Moonlight Butterfly, so ensure you're quick to run into the cave behind you, once you pick it up. Inside this cave you will come across some Man-Eater Shells. If you visited Ash Lake then you'll know that these things can take a lot of punishment and dish it out too, so don't let yourself get mobbed by several of them. Lure them one at a time (Pyromancy is very helpful in disposing them efficiently). As you enter their area, beware of the one hiding in a little alcove to the left, you do not want to get attacked from behind. 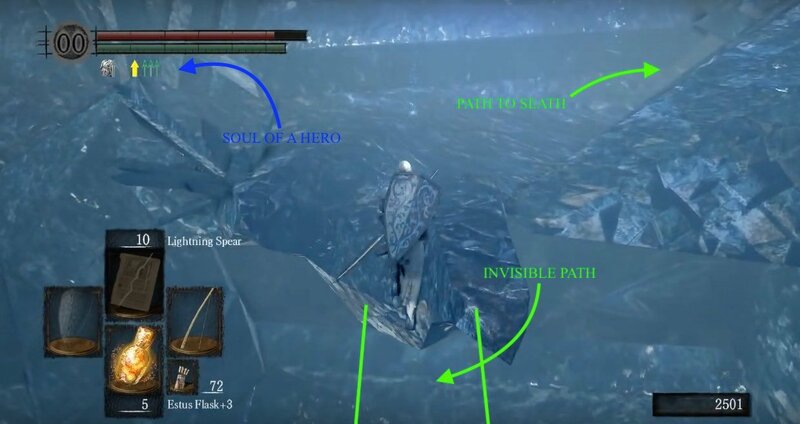 Alternatively, you can just run past them and head in to the large cave to trigger the Seath boss battle. If this is the first time you have been here, the Man-Eater Shells will follow you into the boss arena as there's no fog gate, but Seath's attacks can kill them if they do. However, if you have died already fighting the boss in this arena, a fog gate will appear in front of the arena for all subsequent attempts and the Shells will be unable to follow you through. NOTE: When fighting Seath, attack the tip of his tail, until you cut it off to acquire the Moonlight Greatsword. NOTE: Once you defeat Seath, remember to go back and visit the room where you fought him in the The Duke's Archives again to get some valuable treasure and also face off against a hollowed Big Hat Logan , if you've followed his quest-line correctly. To this end, don't rest at the bonfire (you may light it though) that has appeared in Seath's arena and instead use the Homeward miracle or a Homeward Bone to quickly go back to the Archives. With Seath's Lord Soul collected, use a bonfire to warp to the Chaos Servant bonfire in Quelaag's Domain to continue on to the next area - the Demon Ruins. The Crystal Cave may have inspired the Bloodborne area: "Altar of Despair" (read more). "one side is slightly steeper than the other, so avoid that side of the walkway to avoid falling." Which side? how to go back to "first visiting seath" room? 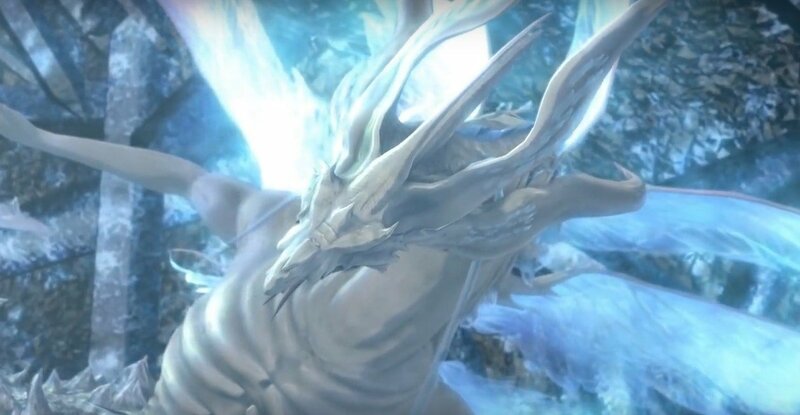 Does anyone have summon signs for the Seath fight? I&apos;m trying to get his tail, but proving quite difficult. Okay but is there any ways to make it less hard ? Even the golems are falling throught the cracks of the invisible bridges and it&apos;s starting to be annoying as *****. If i haven&apos;t completed logan quest line before killing seath can i do it after and then fight logan? no no no..... big hat logan isn&apos;t in crystal cave.... he&apos;s in blighttown. I&apos;m I the first person to discover this? Alternatively you can shoot the invisible floor with arrows instead of using prism stones as a guide. This is a much more reliable method since you can aim the arrows. 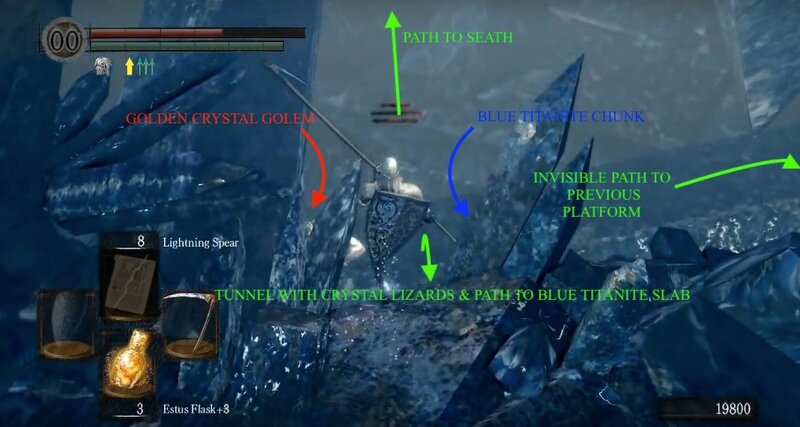 People talk about how lazy and rushed the Demon Ruins and Lost Izalith are, but i&apos;ll be honest with you, I feel the same way about the Crystal Cave. It felt like the devs were rushed to make the area fun but challenging and rather than actually populate it with enemies and such that would make for a fun level, they figured "INVISIBLE PATHWAYS! NO BONFIRE! DUMB CLAM ENEMIES THAT HIT FOR RIDICULOUS DAMAGE AND CAN GLITCH INTO THE BOSS ROOM!" In case you hadn&apos;t gathered, I particularly dislike the Crystal Cave.